In 2016, Upcycle Santa Fe was awarded a research grant through the New Mexico Small Business Assistance program. With the help of a scientist at Los Alamos National Laboratory, Mr. Thom Rahn (Earth and Environmental Sciences), we set out to study whether compressed plastic waste is as safe as common store-bought insulation materials in as far as the rate and type of chemical emissions. In short, this study found that when used as an insulation material, common plastic waste emits no traceable harmful chemicals. For this research project, Upcycle Santa Fe built a dozen tiny-home test boxes, each with an internal room space of 2 x 2 feet, and a wall depth of 4 inches plus exterior paneling. The boxes were built using 2 x 4 inch lumber, wood glue, screws, chicken wire (to hold insulation in place), roofing nails (to hold chicken wire in place), eucalyptus formaldehyde-free paneling for the exterior, and corrugated metal roofing. Eleven of the boxes were filled with sample materials, and one was left empty as a control. 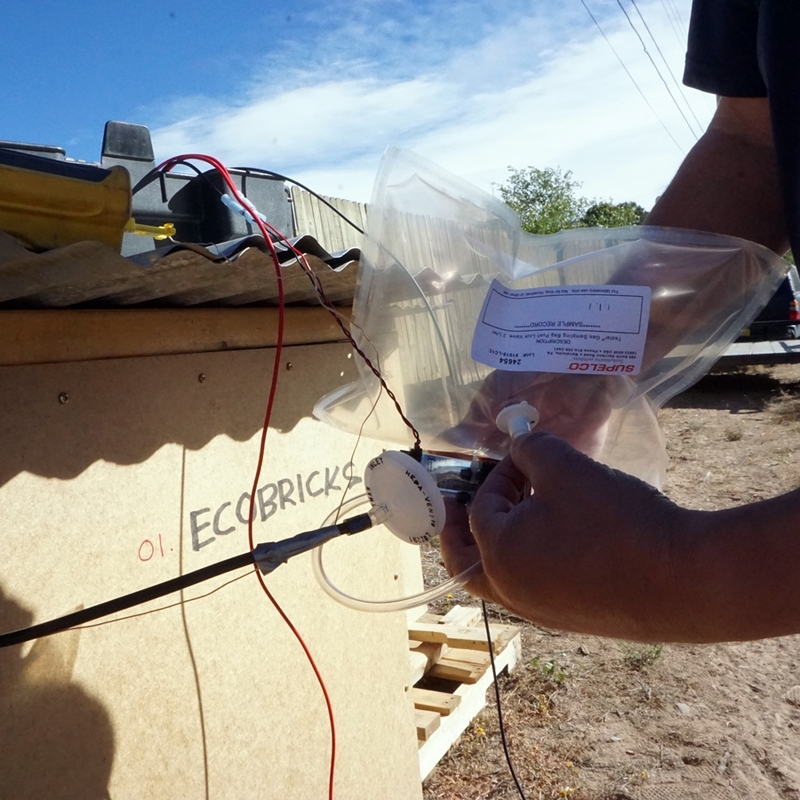 The sampling of the dozen tiny home test boxes was conducted on a bright day in mid-October. Two data collections took place, one in the morning with cooler temperatures and one in the early afternoon when the sun was high. Temperatures were measured externally and internally for each structure, and the air inside was extracted into a tedlar bag using a small air pump. The 26 samples (including background air checks at both sample times) were then taken to the lab for two types of analysis. The first analysis was conducted with an OmniStar Model GSD 320 O2 quadrupole mass spectrometer, and the second with a Leco Pegasus 4D Time of Flight (TOF) mass spectrometer. The first study showed no contaminants in any of the samples above background levels. The second, highly-sensitive test provided only two “hits” on a couple of samples, and one of them was from the background air (a fire was burning in the mountains that morning). The other hit sample was #1 PET Rigid Plastics which was, aside from the empty control, the airiest sample insulation we tested, allowing for potential exterior contaminants to be let in. The chemical discovered above normal levels was 2-Phenyl-3-methyl-pyrrolo(2,3-b)pyrazine(C13H11N3). Although we love studying this stuff we are certainly not experts of chemistry, so if anyone can tell us about what that is then please do! All in all, the final results and recommendations from LANL are hopeful and inspiring for us and all the others who work to upcycle plastic waste into building materials. We undertook this study to provide an answer for all of the people who have expressed their concern to us about the potential harmful off-gassing of plastic waste if used as an insulation material. Through this study and with the help of LANL, we have shown that this concern, although legitimate, should not be a reason to stop plastic waste from being used as an alternative to store-bought insulation. The full report from LANL can be found HERE.